LL KINDS OF MUSICIANS, (especially church musicians) complain often of a lack of freedom. Yet it seems the greatest art pours forth from adversity. I have come to believe that true freedom does not rise from the capacity to fulfill all desires. Freedom is captivity, followed by battle, followed by faith, followed by wisdom and compassion as seen through the eyes of love. Of this struggle, true liberation is born. Video 3: IV. Moderato e spiccato, Go Down Moses, V. Adagio e cantabile, How Can I Keep From Singing? Quite notably, “Ascent to Freedom” received its Russian Federation première in 2012 in the cities of Kislovodsk (Кислово́дск) and Yessentuki (Ессентуки́). 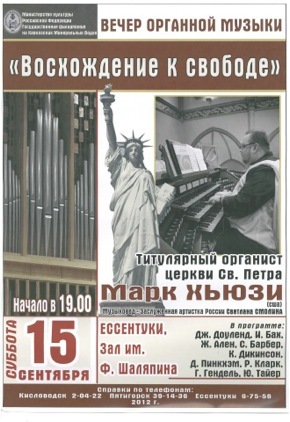 It was performed by virtuoso organist Mark Husey, Director of Music and Liturgy at St. Peter’s Church in Columbia, South Carolina. For those of us who grew up during the Cold War, a performance of an American work that celebrates freedom is something of which we could not conceive. We must continue to work diligently for this freedom through our prayer, struggle, suffering, faith, wisdom, and through compassion. We are reminded that ultimately, this freedom comes from God alone.